Today we share with you one of our favourite Tuscan recipes. Apples thrive in Northern Italy’s cooler temperatures where Italian farmers have been cultivating this fruit for over 2,000 years. 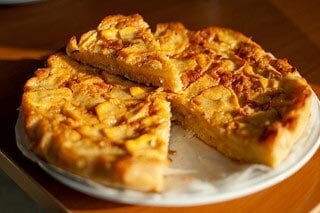 While almost every apple-growing country has its own variation of the classic apple tart; this is a traditional recipe from Tuscany called Torta di Mele! In a bowl mix sugar with butter to make a creamy mix. Add the eggs, flour, milk, the lemon zest, a pinch of salt and the baking powder. The dough should be creamy, if it’s too thick just add small amounts of milk. Peel the apples. Slice 3 ½ and put ONLY the other ½ in small chunks into the pastry. Pour the mixture into a round baking tin, previously buttered and sprinkled with flour. On the top of it, place the sliced apples as in a radial. Sprinkle 2 spoons of brown sugar and cinnamon. Bake for 40-45 minutes. Let the cake cool before slicing. Have we whetted your appetite for more delicious Italian food? Famous for its culinary delicacies and rich cuisine, we invite you to come with us on our cooking holiday in authentic Tuscany – one of Italy’s best loved regions. To find out more check our availability or simply contact one of our experienced staff members.